Western Blot: NHE3 Antibody (19F5) [NB110-61586] - Detection of NHE3 in rat kidney lysate. 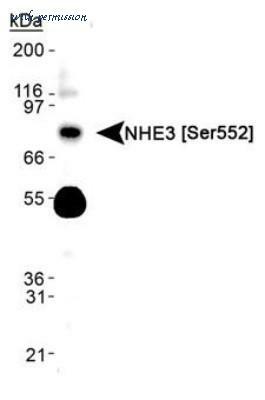 Western Blot: NHE3/SLC9A3 [p Ser552] Antibody (14D5) [NB110-81529] - Detection of NHE3 [p Ser552] in human kidney lysate. Simple Western: NHE3/SLC9A3 [p Ser552] Antibody (14D5) [NB110-81529] - Simple Western lane view shows a specific band for NHE3 in 0.5 mg/ml of Hek293 lysate. This experiment was performed under reducing conditions using the 12-230 kDa separation system. Western Blot detection of NHE3 [S552] in human kidney lysate. Detection of NHE3 in rat kidney lysate using MA1-46355. Western blot analysis of rat small intestine lysate: 1. 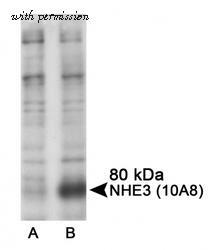 Anti-Na+/H+ Exchanger 3 (NHE-3) Antibody (#ANX-033), (1:200).2. Anti-Na+/H+ Exchanger 3 (NHE-3) Antibody, preincubated with the control peptide antigen.